Cavities don’t only hurt. They can also be a serious threat to your health. Overtime, cavities can lead to the destruction of the nerve inside the pulp of the tooth and create intense pain. This may lead to either a root canal or the loss of the entire tooth. If left untreated, the infection could even be fatal. With this in mind, it might be better to avoid foods that cause tooth decay all together. Here’s a list of a few of the worst offenders. In general, carbonated soft drinks should be avoided. First of all, they tend to contain a lot of sugar. According to Coca-Cola, one can of Coke contains 39 grams of sugar. The American Heart Association suggests this is much more than your daily needed allowance of sugar. Beyond that, when artificial sugar is added to food like in soda, it has no nutritional value unlike the naturally occurring sugar found in fruit. As we know, sugar can lead the formation of cavities. However, this isn’t the only problem with soda. Soda also contains rather harsh acids that can slowly eat away at the enamel of your teeth and increase the rate of decay. Although fruit juice is usually associated with healthy foods, it’s also one of the leading sources of sugar in a person’s diet that can cause cavities. Check to make sure the juice you’re buying doesn’t have any added sugar. Even if there is no artificial sugar, the natural sugar present in the juice can still cause tooth decay. Eating fruit whole may be a better choice since the fiber contained in the flesh of the fruit negates some of the risk. Overall, if you drink juice, make sure to brush afterwards. You have to remember that it’s not only things that taste sweet that can contain sugar. Foods you may have never suspected for being possible sources of sugar include some of the more starchy carbohydrate based foods like potato chips, crackers, pasta and bread. Yes, none of these foods should have sugar initially and probably don’t have sugar listed on the nutrition information on the label. However, when you eat them, a chemical reaction occurs. Starchy foods tend to contain white flour. White flour is something known as a simple carbohydrate. When simple carbohydrates are exposed to liquids for an extended period of time, they can break down into simple sugars. 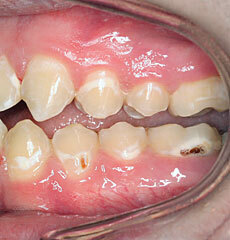 These simple sugars can in turn fuel the bacteria that cause tooth decay. Although it may seem obvious, sugary candies are of course another prime source for cavities. Try to switch to sugar free candy if you must have it. If you do eat sugary candy, choose candies that you chew and swallow quickly. Candy that remains in your mouth for longer periods of time is more likely to cause cavities.